Yarn: 660, 640 yds lace weight; 595, 570 yds dk weight Jennifer Evans designed this piece with her characteristic mix of romantic and rustic. The vintage smocked lace stitch is easier than it looks. 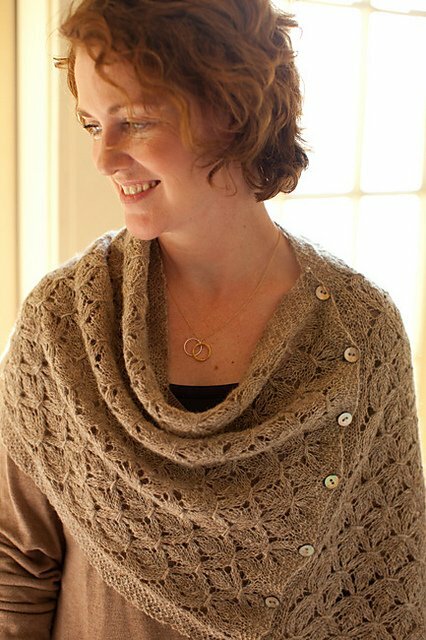 And the simple rectangular shape can be worn as a poncho, a large cowl, or simply a scarf. The shrug, seamed into sleeves, drapes across your shoulders and stays in place with no fuss. Wear it over a pretty dress, or jeans and a T-shirt.